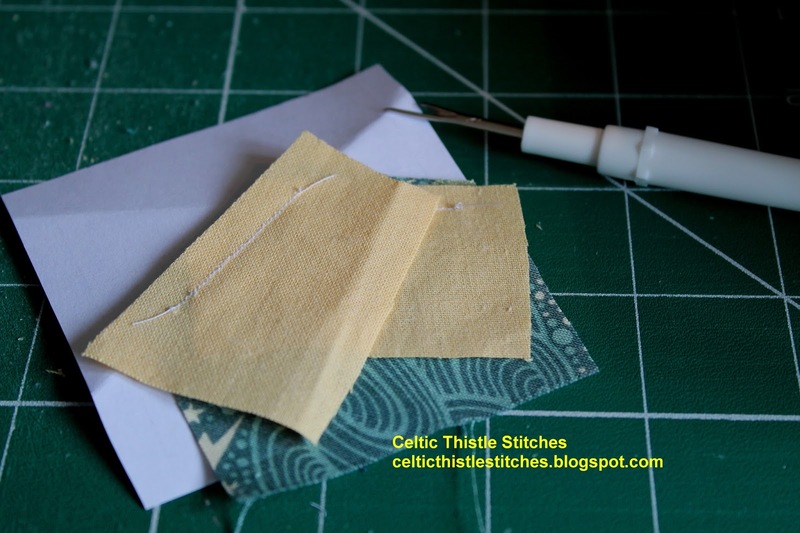 Celtic Thistle Stitches: More paper piecing! So as some light relief from the ironing which was threatening to take over the kitchen, I set to. 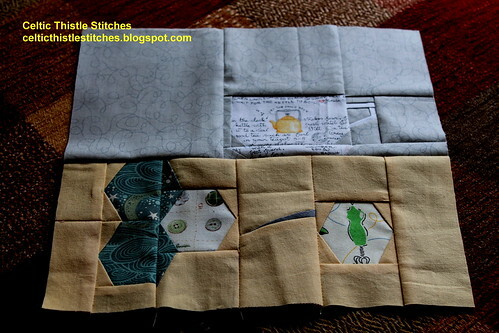 Naturally, this being paper-piecing there were a few hiccoughs along the way! Hmmn! This is what happens when I stop concentrating and start congratulating myself on how quickly it is all going together, I forget to turn the second piece over and iron before I attach the third piece! When I had finished this block I was congratulating myself on actually finishing a block for the BOM in the month that it was posted. Premature congratulations as it turns out. When I checked up to see which blocks I was now missing, I discovered that this block was posted in June so I still had July's to make. Fortunately the paper-piecing mojo hasn't deserted me yet so I printed out July's block and set to. Some of the pieces in this block are tiny! I have yet to mark out the grid lines on the cutting board but I will probably embroider them at the end. I am thrilled to bits that the rotary cutter is actually recognisable too! Your pping blocks are looking great! Woohoo! Your newest blocks are looking fab! Well done on being almost caught up - nicely feeling hey! Love the rotary cutter, it looks fab! I always make really silly mistakes when paper piecing - it requires a far longer attention span than I possess! Love your blocks, especially the rotary cutter! Any progress is better than no progress! Like the rotary cutter, it looks complicated. Well done you, all I've caught up with is reading Star of Africa posts on Flickr!!! Wow Fiona the rotary cutter looks fantastic! Well done. Very nice pp blocks! That rotary cutter is tiny and it looks great. Looking good on these blocks. 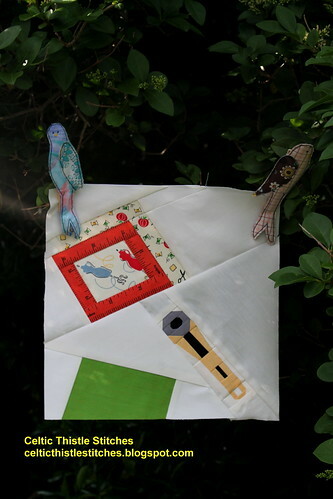 I'd take paper piecing over ironing any day! In fact the only ironing I do is pressing seams. My ironing basket is more of a permanent art installation in my laundry!